I had to miss a lot of rallies this year but still managed to get a pair of Holy Socks to our crew for each round of the ARR Craib Scottish Rally Championship. Here are a few photos from some of the rallies. It's always nice to win a rally but when you win the same rally two year in a row, that's special and that's what Jock and co-driver Paula Swinscoe did on the Brick and Steel Border Counties. Below you see Jock Armstrong, winner of the championship in 2015 and 2016, celebrating in traditional style this year. 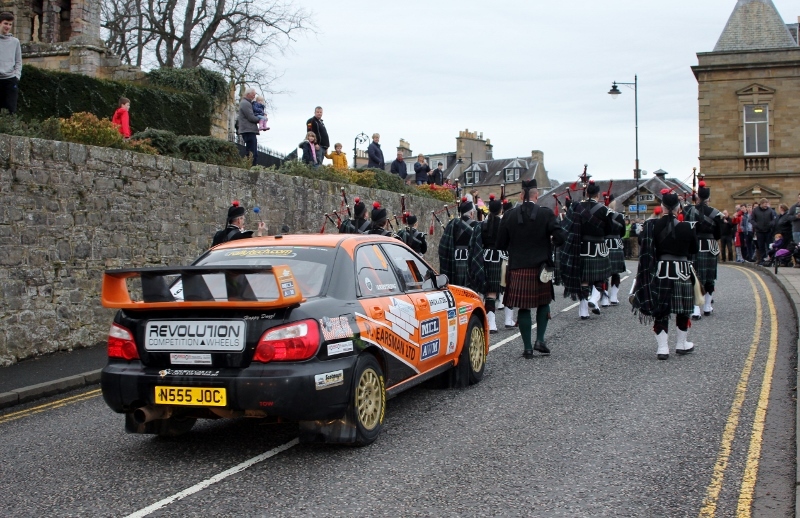 The rally starts and finishes beside the ruins of Jedburgh Abbey. What would the monks have thought - and where is co-driver, Paula Swinscoe? Their win on the second round of the ARR Craib MSA Scottish Rally Championship, added to their place in the Snowman, means the pair are heading the championship by just one point.